Are You Deleting Facebook Messages Or Unknowingly Saving Them? You might find yourself, on occasion, the recipient or sender of hostile or just plain weird Facebook messages. And you likely delete these messages after a period of time by clicking the handy "X" to the right of each one. If this all rings true so far, know that all of those conversations are still there, waiting to come back to haunt you. You might find yourself, on occasion, the recipient or sender of hostile or just plain weird Facebook messages. And you likely delete these messages after a period of time by clicking the handy “X” to the right of each one. If this all rings true so far, know that all of those conversations are still there, waiting to come back to haunt you. It’s actually kind of silly to not catch. When you hover over the X in your inbox, it clearly says “archive.” But who pays attention to that stuff? Also, did you know that every time you “leave a conversation,” those go to your archive, as well? I’ll leave you to that now. Good luck! 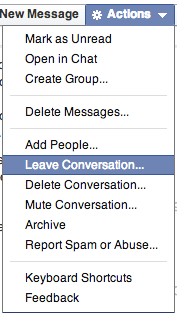 Readers: Did you know about these options for Facebook messages? 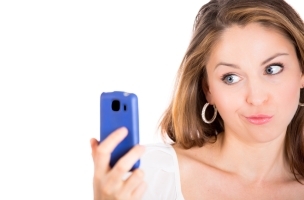 Image of woman with smartphone courtesy of Shutterstock.